One of my favorite times as a parent is watching Connor play. I love watching him when he is up close to his toys and just playing. He will lay on the ground with his face a mere inch or two away from his toys and push them back and forth. I love studying his face as it is all serious while he is doing this. I wonder to myself what he is thinking. I love watching him make little scenarios and listening to him talk them out. 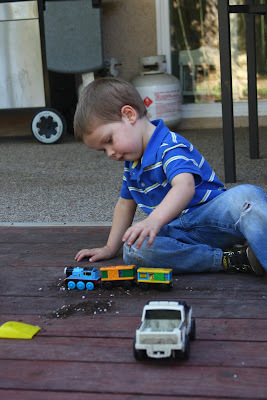 One of his favorites is putting cars on the train track and hitting them with his trains. This isn't something Ian is fond of, but it sure entertains me. Its a great joy to me that Connor enjoys the simple things in life. He can have hours (okay, maybe not hours) of entertainment just with dirt and a shovel. This means he can shovel dirt all over his toys, then wash them off, then do it all over again. I realize this is a pleasure that he won't have forever, so I want him to enjoy it while he can. And I certainly get enjoyment out of watching him play. Its relaxing. Its refreshing. There is something about the way a child thinks that is so amazing. It is unfiltered. They do what they want and don't care what others think. I love it. It allows me to reminisce on my childhood at the same time and I like that. Awww! I remember the way my brother played more than I remember my own playing. He would always try to simulate that his toy helicopter went a long way by flying it past his face, then pulling it back and having it fly by again. And again. And again. It was so funny/cute!